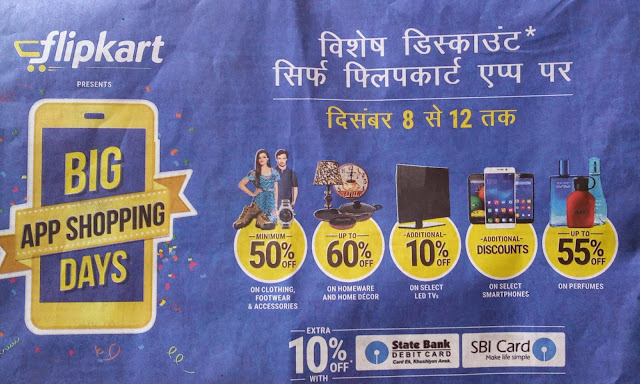 Are Flipkart's bigappshoppings days worth it? Flipkart's been bragging all over across the internet all the way upto newspapers! about their bigappshoppings days.. phew..!! quite a name..?! marketing all over makes them a lot of money though... hey its nice,besides its the only reliable site in India with best customer satisfaction when it comes to online shopping particularly in india.. !! Before going to Flipkart today,and while buying a specific product have a look on some other sites such as amazon,snapdeal.. regarding the price of that product..so you can have a complete idea whether you are sincerely getting a discount, or just slammed away! What usually done is price of some specific products are increased overnight before discount sales,and only 100 rs discount is been given of what its original price was..so be careful.. yes,they had some awesome offers while bigbillion day but since limited amount of products were available, bigbillion day crashed due to raging consumer response all over social media for which flipkart even sent apologies! so be alert,careful while buying a thing.. today.. I would say lay low and Wait for official Great online shopping days to happen that are from 10-12th dec.. including flipkart.. There are some awesome deals up and running now on flipkart like Xiaomi 10400mah powerbank at 899rs i think that's a steal go buy it.. But the grand slam is yet to occur.. From 10th dec so your choice wait or go shopping!! feel free to share this post,+1 the post it helps..